Hi-Tec Thermo Fusion is a strong and effective FAT Burner, which supports the loss of fat tissue and prevents its re-accumulation. The supplement increases the production of heat in the body and stimulates the nervous system, boosting the release of catecholamines. It contains a composition of natural ingredients with a synergistic effect that facilitates and accelerate breaking down the adipose tissue, as well as reduce appetite and support the functioning of the digestive system. Caffeine – purine alkaloid with repeatedly proven effectiveness in the scope of fat reduction. Caffeine increases the release of catecholamines, which stimulate β-adrenergic receptors located mainly in adipose tissue and thus help to release the fat accumulated in it. In addition, it prolongs and increases the activity of cyclic adenosine-3 ', 5'-monophosphate (cAMP), which participates in the lipolysis process, i.e. the release of fatty acids from adipocytes. Caffeine also reduces appetite, increases the production of heat in the body, increases energy levels and delays the appearance of fatigue. Green tea polyphenols – have a wide spectrum of health-promoting properties, but above all, they help to obtain the desired body mass. It was shown that polyphenols found in green tea increase the rate of basic metabolism and energy expenditure of the body. They also intensify burning of fatty acids and, in synergy with caffeine, may reduce appetite and contribute to the increase of energy. Garcinia Cambogia extract – is a plant from the Clusiaceae family, mainly found in Africa and Asia. It produces fruits similar to small pumpkins, which due to its active ingredients have been used for centuries to improve general health and lose unnecessary adipose tissue. The plant contains many active compounds, including xanthones and benzophenones, but the most well-known compound is hydroxycitric acid (HCA). The producer enriched the supplement composition with HCA as to increase the synergistic effect of the natural fat burner. HCA – reduces the production of fatty acids produced by de novo lipogenesis and reduces the activity of enzymes responsible for fat production. It has been shown that it also contributes to reducing the adiposity of fat after a low-calorie diet, the so-called yo-yo effect. In addition, HCA together with the rest of the ingredients inhibits appetite and helps to improve the lipid profile of the blood and regulate the level of sugar. L-Tyrosine – an endogenous amino acid participating in the synthesis of important hormones involved in the reduction of body fat. Tyrosine is a substrate for the production of catecholamines: dopamine, norepinephrine, and adrenaline, which through the stimulation of the appropriate receptors (β2 and β3-adrenergic) enhance the lipolysis process. Tyrosine may also be used for the production of thyroid hormones (triiodothyronine and thyroxine), which, among others, regulate metabolic rate, thermoregulation, and ensure the proper functioning of mitochondria. L-Carnitine – an amino acid that occurs naturally in the body and plays an important role as a transporter of the long chain fatty acids through the mitochondrial membrane. This amino acid binds with the fatty acid to form acylcarnitine, which penetrates into the interior of the mitochondria. Then the fatty acid is used for energy purposes, and L-Carnitine returns to the outside of the mitochondrion membrane to transport another fatty acid molecules. Guarana extract – it is a source of caffeine, but its absorption from the gastrointestinal tract takes longer. The activity of guarana is extended by about 2 hours, compared to caffeine. The properties of guarana’s activity encompass burning of fat tissue and increasing thermogenesis, owed to the caffeine, theophylline, and theobromine contained in it. In addition, the plant increases energy levels, helps to maintain high levels of focus, and also has antioxidant potential. Ginger root – used in Traditional Chinese Medicine and Ayurveda to combat inflammation, nausea and digestive problems, as well as as an aphrodisiac. It accelerates the rate of gastric emptying, improves the lipid profile and increases the thermal effect of food. In addition, ginger intensifies thermogenesis, metabolic rate and promotes blood circulation. Its adaptogenic properties contribute to increasing energy levels, improve cognitive function and reduce reaction time. Chili Pepper or Cayenne pepper is a spicy spice that, in addition to flavoring properties, intensifies the production of heat in the body. Intensified thermogenesis causes intense fat burning in the mitochondria. In addition, Cayenne pepper reduces appetite and supports the functioning of the digestive system. Black pepper – increases the release of hydrochloric acid, and thus supports the functioning of the digestive system. Slimming properties of black pepper were already known in Ayurvedic medicine. Black pepper slows down the process of creating new fat cells and speeds up metabolism. In addition, it increases the absorption of nutrients from the digestive tract and acts diuretic, helping to expel excess water and toxins from the body. 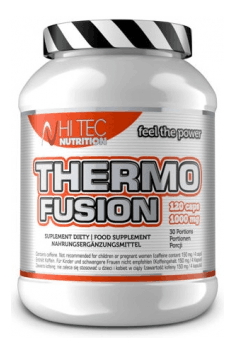 In summary, Hi Tec Thermo Fusion is an advanced, multi-component supplement that promotes the reduction of body fat. The natural ingredients contained in it accelerate the metabolic rate, increase thermogenesis, promote the release and use of fatty acids, and effectively reduce the re-accumulation of fat in the body. The preparation also supports the functioning of the digestive system, and also increases the effectiveness and efficiency of training. Take 4 capsules per day, two in the morning and two in the afternoon, with water. The supplemet will be useful for people starting the fat reduction period, as well as for slightly more advanced individuals with low initial level of body fat. It can be effective at the very end of the reduction or even after its completion to prevent the re-accumulation of fat cells. In order to make the best use of the burning potential, it is recommended to take a portion about 30 minutes before the planned physical activity. Do not consume the supplement in the evening, because the stimulants contained in it may make it difficult to fall asleep and disturb night regeneration. Do not exceed the recommended dose for consumption during the day. Store in a dry, cool place. Capsule (beef gelatin - capsule components, color: titanium dioxide), anti-caking agent - magnesium salts of fatty acids. Ginger root (Zingiber Officinale Radix) as a herbal raw material is widely used as a source of, among others, gingerols. Compounds containing organic components of ginger root are characterized by high biological activity. Ginger root is used in medicine, due to the prevention of infection, to ensure a balance of gastrointestinal bacteria, involved in the production of bile. It has a beneficial effect on the functioning of the circulatory system as an antioxidant, lowers blood pressure, causing a delay in the processes of formation of LDL cholesterol (inhibitor). As a thermogenic it reduces appetite processes and sometimes it is a component of weight loss complexes. Through participation in the transformation of thermogenic lipolysis, is one of the valuable fat burners. The active substances contained in it are a component of arthritis regenerators (in combination with glucosamine including or curcumin). In the sports supplementation it is valued for its anti-inflammatory properties to support the process of healing and recovery after an injury of motor organs (especially the joints). It co-creates so called joints regenerators with chondroitin, glucosamine and curcumin.